The old growth forests you love are in crisis. They are being hit hard by climate change and wildfires, which in turn are impacting our communities and watersheds. And we are still clearcutting at an alarming rate. 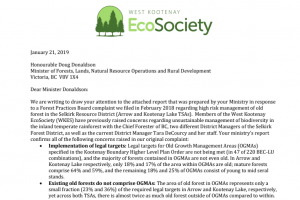 Recently, we sent a message to Forest Minister Doug Donaldson calling for the protection of our old growth forests in the West Kootenays. We have joined over 15,000 BC residents who have sent messages to Forest Minister Doug Donaldson calling for protection of ancient rainforests in BC. Click on the image below to read our message. In 2018, EcoSociety filed a complaint to the Forest Practices Board, under the Ministry of Forests, Lands, Natural Resource Operations and Rural Development, on the mismanagement of old growth forests in the West Kootenays. 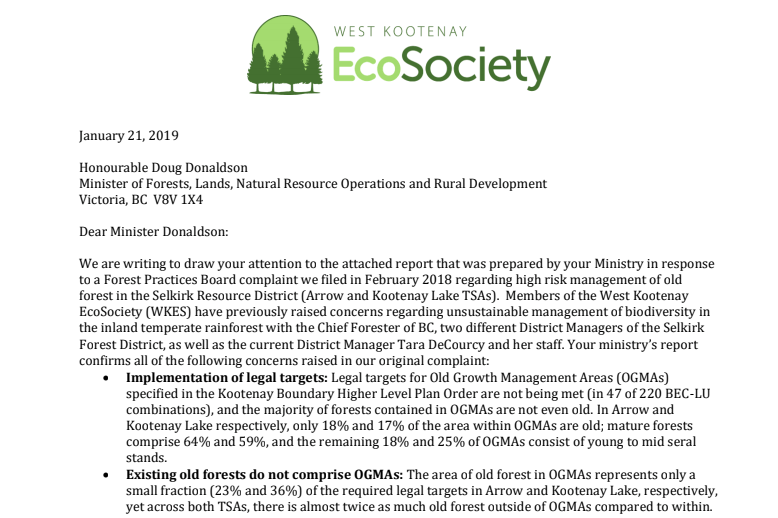 In response, the Ministry confirmed our concerns that West Kootenay old growth forests are being managed irresponsibly. And they are still not acting. We hope that Minister Donaldson will take strong action to protect our ancient rainforests in the West Kootenays and across BC to keep carbon in the ground and protect these special ecosystems.